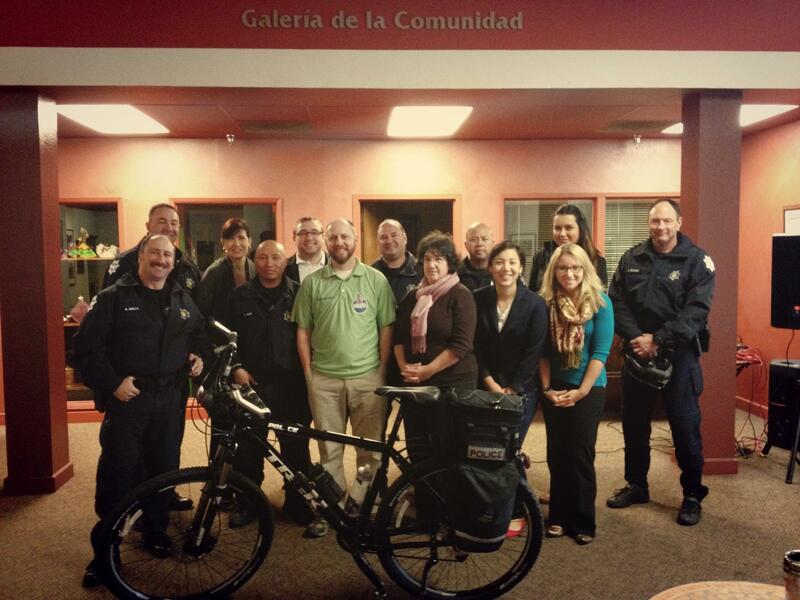 This morning at Arte Americas, Downtown Fresno businesses had the chance to hear from Fresno Police Department’s 6 bicycle officers. This is just one of the many chances that businesses and stakeholders in Downtown Fresno have to engage in the community through the Downtown Fresno Partnership. The Downtown Fresno Police Officers patrol downtown, respond to calls, and work closely with the Downtown Partnership, especially our Downtown Ambassadors, to make downtown a safe place to be. Use the emergency (911) and non-emergency line (559-621-7000) if you need to contact them. And say hello to them next time you see them biking by! Also, be sure to check out the IGNITE art exhibit at Arte Americas that features recycled, re-purposed materials to create thoughtful art. Did you miss out on this morning’s bootcamp? Check out our schedule of upcoming business bootcamps below. The City of Fresno has expanded its State of California Enterprise Zone (EZ). Effective January 10, the Zone now includes an additional 1,800 acres. Downtown Fresno is part of an EZ. If your business is in the EZ, you could potentially receive up to $37,440 in state tax credits for each eligible employee hired. You may be eligible to receive tax credits for certain equipment and machinery purchases. Last year, over 650 Fresno businesses took advantage of this program. To RSVP for this FREE workshop, contact Incentive Zone Manager Kelly Trevino at 559-621-8426. Join the experts at Wells Fargo Bank to learn money management techniques and best practices for your small business in Downtown Fresno. To RSVP, contact cjudge@downtownfresno.org. Learn from a panel of professionals from the VEDC, the California Downtown Association’s Capital Connections Program, Wells Fargo, and the EOC CDFI on the various options for small business lending, ranging from banks to alternative lenders, from small to large loans. To RSVP, contact cjudge@downtownfresno.org. Join the Economic Development Corporation for an in depth look of the high speed rail project, how it affects downtown, and what it means for you. To RSVP, contact cjudge@downtownfresno.org. Learn how Downtown Fresno businesses can use energy credits and other green incentive programs. To RSVP, contact cjudge@downtownfresno.org. DNA Social helps Downtown Fresno businesses become more savvy with social media just in time for the holiday season. Join us at Joe’s for cocktail hour and improving your social media! To RSVP, contact cjudge@downtownfresno.org.